Dr. William Fox attended David Lipscomb University in Nashville, Tennessee for his undergraduate course of study in biochemistry. He then attended The Southern College of Optometry in Memphis, Tennessee where he was inducted into the Phi Beta Kappa honor society and where he graduated with a doctor of optometry degree. Dr. Fox's externships were at the Biloxi, Mississippi Family Health Clinic, Indian Health Services Department of Ophthalmology, and the Portland Eye Clinic at Pacific University. His externship studies were in the diagnosis and treatment of eye disease and contact lens evaluations. Beginning his career in Atlanta, Georgia, Dr. Fox worked in the Ophthalmology Department, under Dr. Joe Citron, at Crawford Long Hospital. 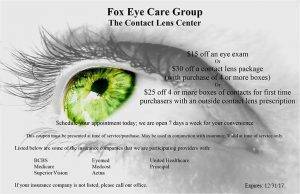 He started Fox Eye Care Group, located next to Lenscrafters, in 1991 in Greensboro, NC. The practice has since grown to 5 locations throughout North Carolina and including Winston Salem. Dr. Fox specializes in contact lens evaluations, diabetic eye exams, and overall family eye health evaluations. He is a 20+ year member of the American Optometric Association and the North Carolina Optometric Society. Dr. Fox was twice awarded the Horizon Award from Lenscrafters for a combination of professional skills and humanitarian endeavors. He was awarded the Wesley Jesson (now CibaVision) Contact Lens Fitter of the Year award in 1998. He continues to work with the Gift of Sight Foundation (now called OneSight) at home and abroad, helping the needy and disadvantaged. Dr. Fox is the treasurer on the national board of ALLDocs, the independent doctors of optometry next to Lenscrafters. 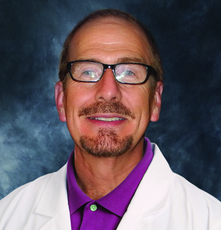 Dr. Fox enjoys traveling, playing basketball, and surfing during his free time.